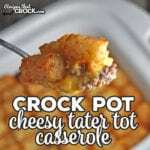 This Crock Pot Cheesy Tater Tot Casserole is a crowd pleaser for young and old alike! I’m guessing it will instantly go on your “go-to” recipe list. Mix together your browned ground beef with your soup. Spread your ground beef mixture in a casserole crock pot or 4 quart crock pot. Lay your cheese slices evenly across the top. Place your tater tots on top. If you want to brown up the top and your crock is oven safe, place your crock in your broiler on Hi for a couple minutes, watching constantly. You won’t use your entire bag of tater tots, but a 16 oz bag wouldn’t have covered the top in my casserole crock. So you can just have some extra tots in your freezer to enjoy later!